Lets work together to create an individualized, hands on experience for your students! Pioneer Days…. Colonial Days….. Nature Hikes….. Planting…….. Harvesting….. Life Cycles….. Critter Carrivan and more. Our Unique Property opens itself up to a variety of possibilities…. Wooded Hiking trails… a pond…. meadows….. the East Aspetuck River…. a barnyard with animals and a hands on educational vegetable garden. 2. The History of Farming in the area, Nutrition and the science of growing. A collaborative field trip between the Pratt Nature Center and Great Brook Sugar House at Sullivan Farm. Program Description: Smell the Sugar. See the Steam. Students will gather around a campfire and listen to Native American and Colonial folklore and legend as they learn how we turn maple sap into the sweet treat we ALL love! We will travel through time to a Civil War Era flat pan before heading off into the sugar bush to tap a few maple trees. Students will use an auger and collect a bucket or two of sap. They will also see a demo of modern day tubing that is used to gather sap more efficiently. We will then get back on your bus and travel to Great Brook Sugar House to see a modern day Sugar House and evaporator. The field trip wouldn’t be complete without a quick taste of 100 % pure Maple Syrup! We can accommodate morning and afternoon classes. Completely OUTSIDE! Dress Appropriate to Weather. States of Matter, Seasons, Life cycles, History, Weather, Climate, Natural Resources, Local Economy, Traditional living Skills. • “Chicks and Salsa” (pre k and up) includes the reading of Chicks and Salsa along with the making of your very own salsa. • “Pioneer Days” Panning for Gold, blacksmith, campfire songs, a trading post are just a few of the eight different hands on station your students can enjoy. Experience a real life Oregon Trail. • Nature Hikes/Walks Enjoy the changing of the seasons. Each season brings us something new. 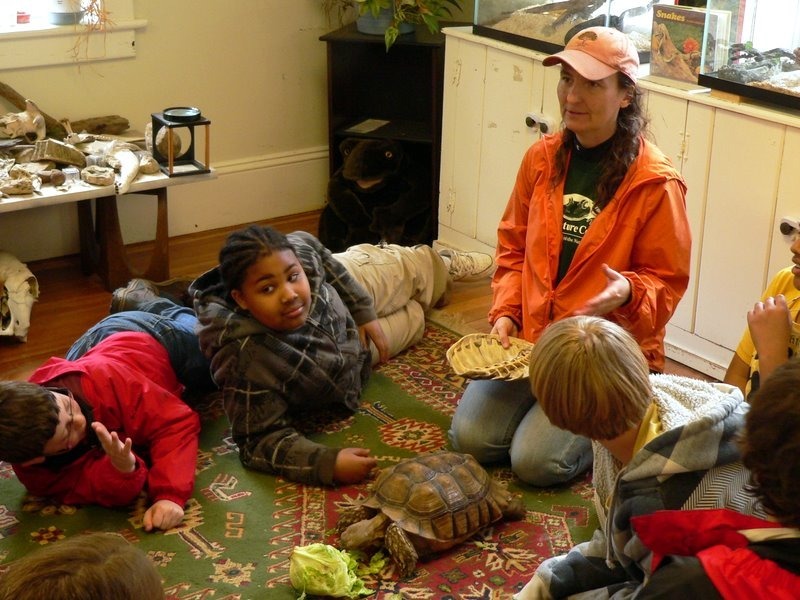 either at your school or at the Pratt Nature Center have included….